Warhammer Tau: Anyone Else Sick of Playing Space Marines? Are you sick of playing WITH space marines or AGAINST space marines? Because I've got to admit that after playing Space Wolves for 2 years it was seriously doing my head in. 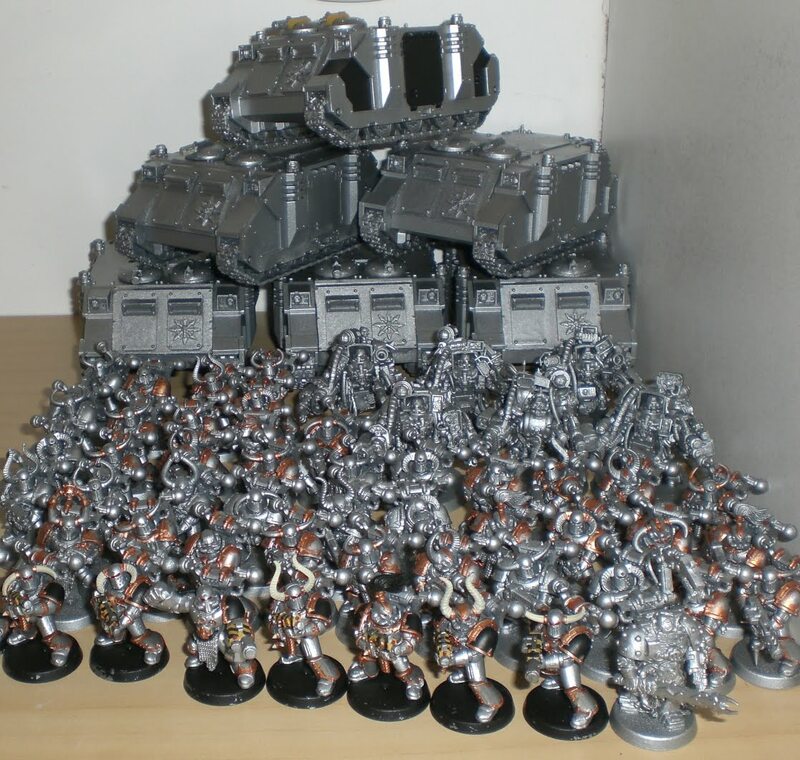 Ironically, when I first got my Space Wolves, James warned me that they were a bit of a 'gimmick' army and at the time I didn't really get what he meant. I thought he was describing how they get into their Metal Boxes and drive straight into the enemy guns, get out, launch a massive spaz attack and proceed to punch things in a berserk frenzy. Then Blood Angels came out. James said they were a gimmick army too. They did the same kind of thing, but with Feel No Pain, which made them harder to kill with shooting. Then Grey Knights came out and James said they were a ....no wait, he said they were outright disgusting! Then he said they were a gimmick army, because the whole force revolved around the success of 1 gun - the Psycannon. So What Is a Gimmick Army? According to James, a gimmick army is a force which relies upon 1 thing to succeed in the game. A bit of a gimmick or one-trick-pony you might say. 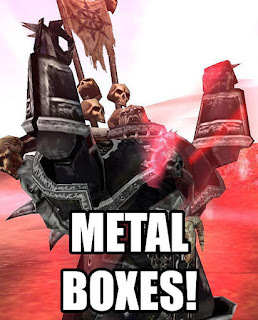 Grey Knights Psycannon spam, every Blood Angels army running Mephiston and Assault Terminators with Sanguinary Priests, every Space Wolves army running 3 packs of Long Fangs. These are gimmicks. But what happens when Rending gets toned down in the rules? Or when Feel No Pain gets changed to tiers of resistance to injury? Or when the missile launcher simply isn't effective against tanks any more? Maybe the meta game will simply move on? Then these armies will need to use the other options in their Codex books to be effective. Speaking from experience of playing with Space Wolves, I soon discovered that even my best strategies required me to take a round of fire to the face from the enemy. Sometimes my Metal Boxes made it across the table. Sometimes they exploded. And when they did, the Grey Hunters inside got pounded by every single gun under the sun. Sometimes they died screaming, sometimes everything seemed to bounce off them. But considering that a Space Marine army relies primarily on passing an above average amount of its armour saves and cover saves, perhaps it's not the most tactical thing around? Behold, my Iron Warriors army! Armed to the eyeballs with plasma guns, melta guns, combi-weapons and Obliterators with more plasma, melta, lascannons and all riding in Metal Boxes (with combi-weapons!) this is a gimmick army too. In fact, I really should finish painting it, dip it, flock it, varnish it and then probably sell it in time for Codex Chaos Legions to be released. Then James can tell me what a fool I was for selling it, because Chaos Legions are the new wicked sick! Or something like that. Truth is, I got bored playing it. All I ever did was drive towards enemy in Metal Boxes, pop smoke. Drive towards enemy in Metal Boxes. Get out, shoot, charge, punch things, pass armour saves. Obliterators Deepstrike and shoot some stuff. Win/lose. Despite his pointing gimmicky finger, James is a Space Marine player at heart. He may have Dark Angels, but he plays the regular Space Marine Codex and fields a pure Deathwing or Ravenwing army to mix things up a bit from time to time. However, his forces are always incredibly balanced, very versatile and able to take on any threat. Sure, he may not massacre his opponents, but he's never in a situation where he's likely to be massacred like some meta game rock/paper/scissors style armies. While his army is nice and varied, I personally can't stand playing with it. It does nothing for me strategically and relies on your ability to nail enemy tanks with lucky lascannon shots and to pass most of your armour saves. Although it's not quite so bad to play against once you accept that James only fails 1 in 6 armour saves opposed to 1 in 3, which is statistically correct. I guess, this is what separates Space Marine players from non-Space Marine players. Because James (gawd bless 'im) has a wonderfully inane belief that his troops should be able to shrug off torrents of enemy fire and that even if he were facing a completely identical Space Marine army (in a different colour), that it's only common sense that his Space Marines would obviously be far better at everything. Real life statistics don't even begin to enter into this. More sickening still is the fact that this belief seems to work for him. He constantly beats the odds, quite literally, during the first 3 Turns of the game. Although we've since learned that the longer a game goes on, the faster his luck runs out. Hitting tanks on a 2+ and 5+ cover saves could totally change the Warhammer 40K game get again, almost bringing it back to 4th edition when line of sight blocking was rife and whole armies could be wiped out by Turn 3. Of course the Space Marines will get a brand new Codex, but with more AP3 guns in the game than ever before, how will they cope with a reduced cover save and will the mentality of simply passing lots of armour saves continue to pay off? Only time will tell. I think part of the problem with Marines is how they are peddled to the customer. You have CSM, DA, SW, BA, BT, GK and SM. 7 of some 15 Dexes are Marines. The Marines have the biggest range of miniatures, and so you get a lot of cross fertilisation from the one range for most of those factions. And the HH series is all about Marines, really. As are many of the BL books. Our diet is heavily focused on Marines. I understand why GW does it. Marines are cool and cool sells. But if they invested similar effort into Sisters [which I guess is more 3+ saves, lol] and Xenos, then people would be more into such armies than they are now, I am sure of it. It is only natural that having nearly half the Dexes with a 3+ save, s4 guns and Rhinos - Rhinos? The cowards, the fools! that it would get a bit boring after awhile. I don't think any other game system has such a hero faction as 40K does Marines? Even in Fantasy, GW has avoided spamming one group. People tell me that in 3rd or 4th ed. Marines were a weaker Dex than others out there. Yet still Marines were the most selling faction. How much more will they be seen when they are either solid (C:SM) or excellent (C:SW, C:BA, C:GK)? In 2nd edition (outside of Terminator armour) Space Marines had a really tough time due to armour save modifiers. Eldar ruled 2nd Edition. 3rd Edition was close combat madness. 4th Edition was home to some of the cheesiest army lists we've ever seen (mostly Eldar and Iron Warriors). 5th Edition started in favour of horde armies, turned Mechanised, then got Marine spammed at the end with a host of new Marine Codex books. So the current edition has seen the most change and it's due to the Codex books. But look on the bright side, because all marines die the same! I think that 6th edition will see the 'rise of the xenos' and bring balance to the force...er...I mean, the game. I actually use a SM army, and only 8 games in I'm still enjoying playing them. In my gmaing group however I can see what you mean about playing against them too. Out of the 7 games of 40k I've played, 6 of those has been against power wrmoured opponents. Playing against the Orks was a huge welcome change believe me! Also, evey army I've played against was exactly what you said, a one trick pony. Grey Knights rely too heavily on the psycannon and had me beat in a close game. I played a thousand sons army that was basically a terminator unit, a sorceror lord, and a squad of thousand sons which I outnumbered almost 3-1. The space wolf army with two squads of long fangs and thunderwolf cavalry turnded up too. I am a vanilla marine player my self. And I have to say that whilst playing against other marines is getting boring, I am not bored of playing them my self. The reasons for this I think are that 90% of people take those one trick pony armies you are talking about, and it makes playing them VERY boring! However I make a point of mixing it up, not taking the generic box armies and whilst it doesn't win anywhere near as much, I have mucb more fun than some people seem to. 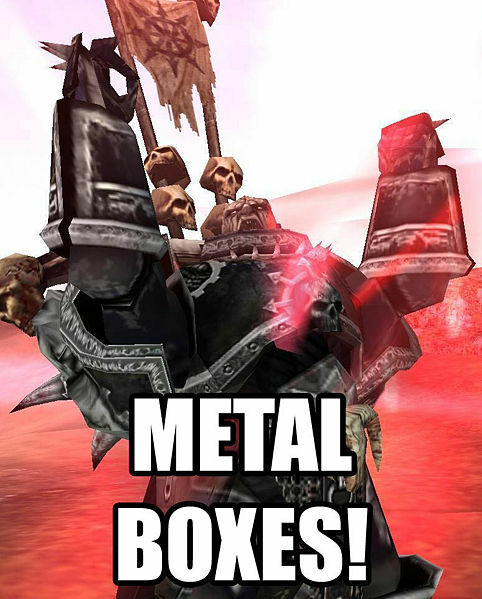 And my opponents seem to enjoy it more than box armies too. Single biggest reason I haven't picked up a game in six month. When you open your eyes and realise that GW is a small (and very warped star) piece in the wargaming heavens ... then playing it is totally dull. Speez Marins are killing the tournament scene as fast as the frankly laughable rules undermine confidence. The best games I've played have ALL been one's where the 'galaxies finest' stay at home. They are so boring.